Hello Folks, I have had a lot of people be making comments on my Knight, so I decided to make him open and public completely and give you an example of a well rounded spec Knight. Knights can be either offensive or defensive, but I find that a balance between the two can be more of an advantage for overall play. As you will see I am equipped with Legendary 40 Gear, my jewelry is level 50 and I am not currently going to make them legendary. 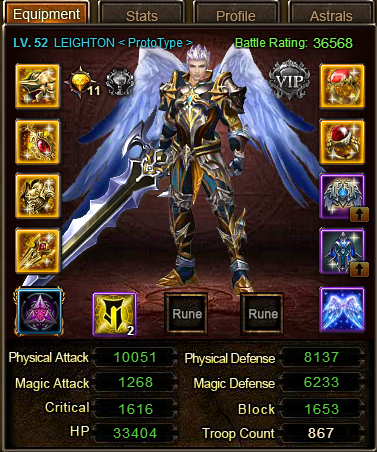 Stats shown are base stats, no pots or scrolls. 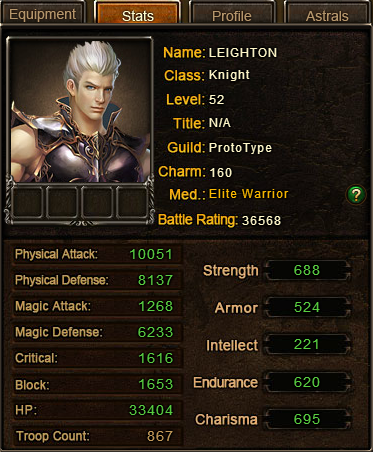 This is LEIGHTON, I play on S31, AGM of Prototype. 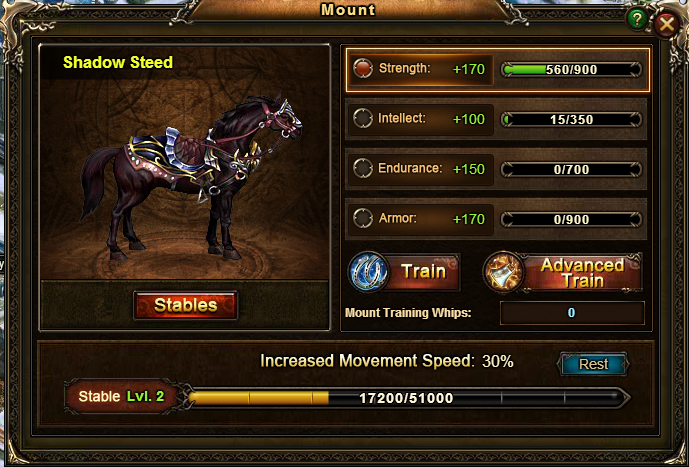 As you can see from the mount stats, they greatly influence overall stats and mounts should not be ignored like I see a lot of players doing. 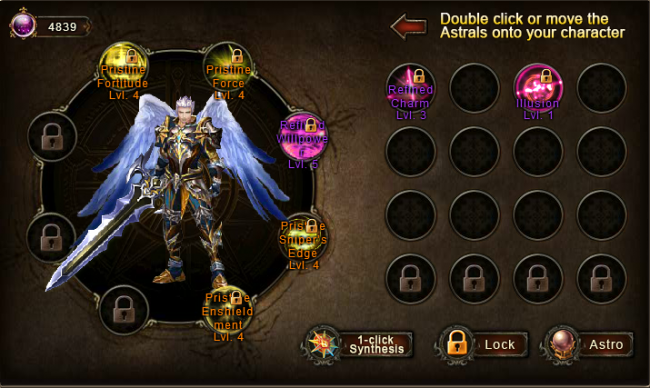 Next is my astrals page, my astrals are chosen for a rounded spec, not complete defence and not complete offense. This area is up for debate with alot of players, I like to be different in my play type and not do what everyone else does, this has served me very well thus far. Yes I am severely lacking in this department but am upgrading as best as I can. Prototype currently has Skill tower level 7, soon to be level 8. But these are my current skill levels, I hope to be maxxed out on all in the very near future, and yes even intel for us knights because that adds to our mdef. I do not have Dual spec, I am only single spec. 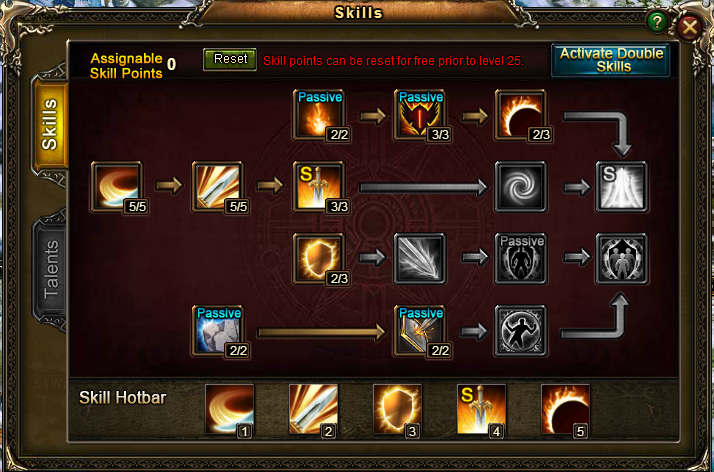 but this is my current talent tree. I am a firm believer of maximizing the bottom of the ladder before skipping all the way to the top, it is not really needed to have the highest attack in the tree at a lower level. if your patient, the power will come. Gems should be upgraded at your best possible speed, I am still currently upgrading my gems to have all level 5 gems. this takes time with a lot of catacomb runs and a lot of gold for conversions, a good deal of my gems are level 5 and greatly contribute to overall stat base. If requested I will add them here but at this time I will leave my gems out. I will keep my level 40 Legendary gear until level 60. When potted up Leighton can hold his own up against some great opponents. He is well known on our server and will continue to grow and be a fighting machine. I don’t always win, but I make it hurt enough that they never forget! Like I said before most people spec for offensive or defensive, I prefer balanced. Do not underestimate the advantage of the level 40 legendary gear. You can save a lot of resources along the way to 60 for the 60 gear, I had bought and have since sold the 55 set and this was done as a results of fighting those of whom had the sets and I found even though they had the set advantage of lowering my defense, I still end up standing more times then falling. So as you build your character I suggest getting legendary 40 gear along the way and skipping the rest of the gear until level 60. I prefer the pve gear because rage maintenance is a lot easier to maintain then the pvp gear, yes you get the rage boost at the beginning, but that is a short advantage in my opinion. A well timed rage steal sends them reeling back and your opponent takes longer to build up again then you do. I hope this was informative enough, I will give an update to this at level 60 ish when I have attained level 60 Legendary gear. Thank you all and may you be the last one standing at every skirmish. I would actually like to know what gems you have. I am guessing Patk, crit, block, and Mdef. For anyone who knows what they’re talking about… The level 40 Rings and Jewels are better than the 50s. So if you choose to take the time to farm the stones for them, it’s worth it, because you won’t replace them until 60. As for full Legendary 40s? No thank you. You might recup Rage faster than I do, but how fast you build Rage means nothing if you’re dead in 2 rounds. Overall, though, the information here is pretty sound. The only real issue I see is the Orange Crit Astral, which could be and should be Goddess Blessing in my opinion, although some Knights will say to go the Will Destroyer route. don’t believe this omgreally..i am currently using legendary gears and its awesome…yes its true that its hard to farm for legend stones and crystaloids but its all worth it..you just need patience and dedication to have this gears. Lol.. Horrible build, I’d crush you with 55 set on, no doubt at all, level 40 legend is garbage, takes too long to get. And good luck with intercept before I blast off whirlwind and kill all your troops in BG. Don’t follow this idea, because you’ll spend too much time farming legend stones, or god forbid, buying them.. Its’ not worth it. 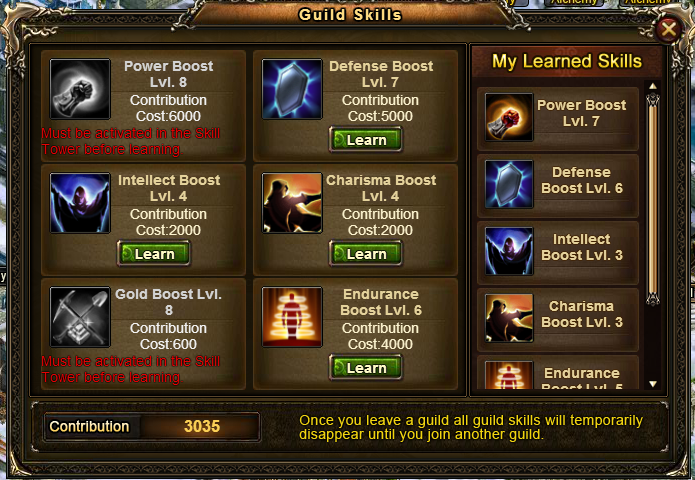 very infomative…how about the knight skill combo for lvl 30’s?..